Researchers at Aalto University and York University have succeeded in creating a water-repellent composite structure out of lignin particles, in which the enzymes or biocatalysts can be separated from surrounding water. The breakthrough was accomplished when the researchers discovered that, by regulating the surface charge of single lignin particles, enzymes can be made to adhere to the surface of particles. As material supporting the structure, they utilised a natural polymer isolated from seaweed. The starting point for the research was the need to utilise lignin, a pulp industry by-product, for new, large-scale purposes. 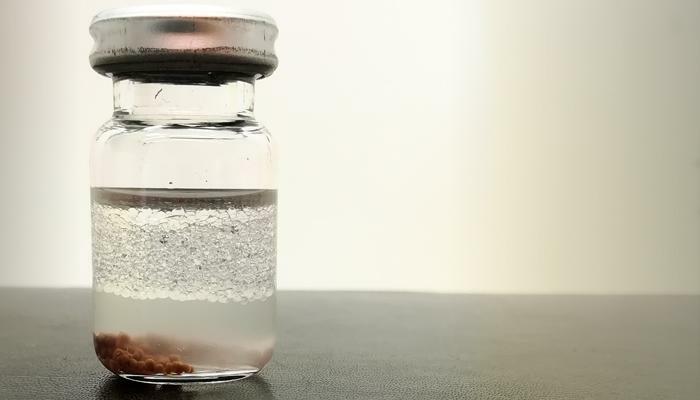 The researchers were surprised to discover that, when introduced, the lignin particles multiplied enzyme efficiency and enabled enzyme recycling in a synthetic reaction that would not otherwise occur in water. "The beauty of this method lies in its simplicity and scalability. We are already able to manufacture lignin particles in batches of several kilogrammes. Of course, we hope that this will become a sustainable option for the enzyme industry to replace fossil materials in technical applications", says Postdoctoral Researcher Mika Sipponen. Lignin not only multiplies enzyme efficiency, it also shows good results in comparison to those substances currently on the market, created from unsustainable sources. "The commercial enzyme we use as reference is attached to the surface of synthetic acrylic resin produced from fossil raw materials. In comparison, this new biocatalyst was at best twice as active", Sipponen adds. In the reaction, alcohol and organic acid created in biofuel production produced a water-insoluble ester with a pineapple scent. The process opens up new possibilities for the production of bio-based polyesters, as well. "We are pleased that the years of investing in the lignin particle research are beginning to produce significant results. We envision several possible uses for spherical particles in green chemistry processes and the development of new materials", says research leader Professor Monika Österberg.